Flowers and petals have always been popular amongst kids. 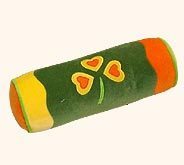 Nothing better when they find their favorite tri-petal flower designed in their pillow, cushion or bolster. We make use of synthetic colors that are do not cause any harm at all. 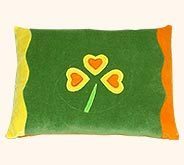 The cushions are soft and tender, easy to maintain. We supply in bulk as per the requirement of the clients. 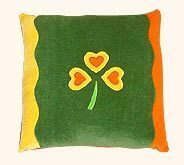 Desc : Yellow & red colored designs of tri-petals have been created on green, yellow & red background of these kids rectangular pillows. Desc : Suitable for your little prince & princess. Beautiful tri-petal designs make these multicolored baby bolsters look tantalizing and magnificent. Desc : These lovely & comfy kids cushions can be used by tiny totes while sipping the tea and watching favorite TV programme. 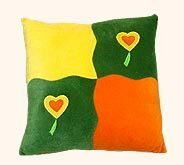 Desc : These heart shaped stylish pillows in luscious colors are fashion staple in the personal rooms of every little one. 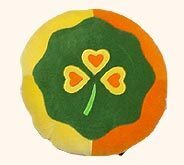 Desc : Attractively designed these round shaped decorative baby pillows are not only decorative but also highly functional for the kids. 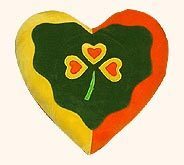 Desc : These red, yellow & green colored elegant baby cushions are beautifully decorated with heart shaped petals on green base.